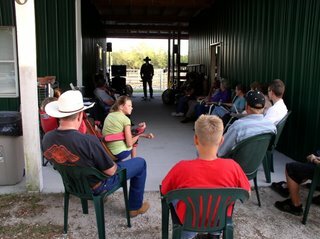 After patiently waiting we now have a permanent location for our Cowboy Church. The Heart H Ranch in Davenport, Florida. When we first started our ministry, we contacted Tim Wilder, the pastor of First Baptist Kissimmee, to let him know what we were doing in the area. He has been an encourager ever since, even passing out our flyers to his congregation when we have special events. Last month I sat down to talk with Tim again just to update him on our progress and some of the challenges we faced. Before I left I gave him an outline about the Cowboy Church along with the mission statement and goals. A couple of days later I got a call from Quinton Bass, the owner of Heart H Ranch and member of First Baptist Kissimmee. As we talked he told me they had seen us at some of the Junior Rodeo events where they had attended Cowboy Church. Tim had also given him the Outline of our church and told him about our cowboy ministry. We setup a time to meet and visit him and his wife. Once we saw the place both Suzanne and I knew this would be a great place for Cowboy Church. So we left that day both agreeing to pray and let God lead us. I was about to start the Central Florida Fair for the next ten days so I really couldn't do any thing until that was over on the 30th of April. Quinton and I talked just before the fair started and he agreed with me that the Heart H would be a good location for The Cowboy Church of Central Florida. So we made plans to have our first service on May 4. On May 4 we left our house on the East side of Orlando and drove 48 miles to the Heart H Ranch to begin setting up at Heart H. Basically we are driving from one end of Orlando to the southwestern tip just below Disney. At 6:45 cars began arriving and by the time we started the service we had 30 people for our first service. I was very encouraged about the attendance. Since we had to move around so much after January we had lost a lot of our regulars just because of the drive. But no matter what, God has shown me that we must persist despite the odds that we face because it's not always on a smooth path that Gods lays out His plan. Prayer and communicating with God each and everyday is where He wants us. The way He communicates with us is through His word and also the message that His son Jesus Christ shares through-out the New Testament. This combined with prayer and fellowship with other believers is the best way to grow in the daily walk with Christ. During one of her early riding lessons, the horse our daughter Devin was riding decided to take off and run around the riding ring. Devin lost her balance, performed a beautiful, although unintentional head-over dismount and crashed to the ground. Seeing what was happening I was already running to where she had landed as was the owners of the arena. We checked her out and made sure she was ok. Before her tears were even dry the owner of the ranch was walking Devin back over to the same horse that had just run away from her and proceeded put her back in the saddle. Devin didn't want to get back on, but her teacher ignored her and helped her right back up into the saddle. With alot of encouragement and attention my daughter was right back to her routine finishing up her lesson, a little shaken but wiser for the experience. Despite our best efforts there are going to be times when we get thrown to the ground. Yet the worst thing we can do is hesitate to get back in the saddle. Jesus faced it at Gethsemane but despite the odds He submitted to His Fathers will. The victory comes in overcoming, and through Jesus we have the power, not only to overcome the odds, but to conquer.